Cosmetic dentistry can dramatically improve your self-confidence by making you feel at ease when you laugh and smile. Whether you worry about the colour of your teeth, feel anxious about their alignment or hate to reveal the fact that you have some missing teeth, there are forms of cosmetic dentistry that can change your life. One of the most popular and least invasive forms of cosmetic dentistry, teeth whitening procedures can transform a set of grey or yellowed teeth into a sparkling white smile. You can use home whitening kits to achieve this result, but you will get an even more beautiful look if you visit a dentist who specializes in cosmetic dentistry. For example, two hours of pure laser treatment can give you white teeth for up to six months, and kickstart laser treatment is more affordable but also lasts for six months (the reduced price simply reflects the fact that you will need more than one cosmetic dentistry appointment). If you have missing teeth, implants are a wonderful solution. This type of cosmetic dentistry involves screwing an artificial root into the gap, and then fitting a natural-looking prosthetic tooth onto this sturdy root. A specialist in cosmetic dentistry will take care to make sure that implants precisely match the shape and color of your existing teeth, so most people will be unable to tell them apart from real teeth. 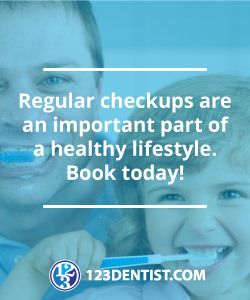 In addition, they help you to chew normally and restore your normal bite, improving oral functionality. Please note, we do not do implants at this office. Ask us for referrals! Cosmetic dentistry often involves straightening crooked teeth. This is traditionally done using braces, which slowly correct the alignment of the teeth over several years. However, with the introduction of new technologies like Invisalign, it is more convenient (and less noticeable) than ever to straighten your teeth. If you don’t like the way your teeth look, you can ask a cosmetic dentistry expert to make veneers. They usually last for at least two decades, and they are porcelain slices that will be shaped and colored to correct the appearance of your smile without looking obviously false.